It’s a booming sellers’ market in Michigan, and many homeowners are looking to take advantage by making their homes more attractive to prospective buyers. Others are making home improvements they can enjoy now, with the hope of increasing the value of their home to sell in the future. On average, 33 percent of home shoppers are more likely to buy a home that has been recently renovated, according to HGTV. Bathroom- If you’re looking for a guaranteed way to get a high return on your investment, consider remodeling or even adding a new bathroom to your home. A bathroom project costing $13,000 can add $11,000 to a home’s asking price, which ends up giving you an 85 percent return on your investment (ROI). on investment if done right. New Deck- It’s every homeowner’s dream to have a comfortable, inviting deck space for entertaining, especially in the summer. New decks are not only great for the homeowner in the short-term, they’re also good for adding long-term value. According to CNBC.com, a new deck costing $15,000 can add about $11,000 to your home’s asking price, an ROI of 73 percent. Exterior Facelift- Whether you choose to spend on landscaping, paving your driveway or even adding smaller items like shutters to your home, fixing up the exterior can pay big dividends both for adding appeal to prospective buyers and your personal mood when arriving home each day. According to Bankrate.com, a good first impression can add 5 to 10 percent to the value of your home. Kitchen- Quite possibly the most popular home addition, a kitchen can add a 100 percent return rate if done right according to TLC.com. It’s important to stick with a central theme, color pattern and style when remodeling a kitchen to make it an inviting place. 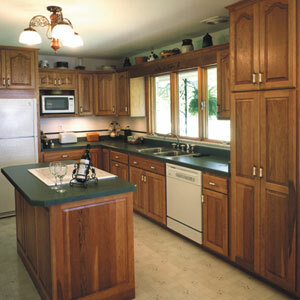 Adding a window over the sink or an island counter space are also great ideas that yield returns. For more information on how to obtain a home equity loan from Community Financial to make the improvements you’ve always wanted, please stop by any of our eight branches or visit this link. and also its value market.